3 VACANCIES LEFT FOR COURSE & WORKSHOP! To register, please make full payment for the course / workshop you are interested in by clicking the Paypal BUY button below. All course / workshop / master classes are held at 85A Serangoon Garden Way Studio. Please email us at serangoon@PilatesFitness.com.sg or contact us at +65 8322 9552 if you have any questions. We are very excited to invite STOTT PILATES Lead Instructor Trainer, Sarah Jarvis, from STOTT PILATES Headquarters Canada to teach the Intensive Reformer course. For the first time in Singapore, we are flying in full time Lead Instructor Trainer from STOTT PILATES HQ to teach the Reformer course – this is as close as it can get to flying over to Canada and take the course directly from STOTT PILATES! Sarah will bring with her not just a decade of Pilates knowledge but also the latest techniques fresh from the STOTT PILATES oven! Discover how to design and instruct effective Essential and Intermediate Reformer workouts in personal training and group settings for a wide range of clients. Learn a variety of modifications and variations to expand programming options to meet the specific needs of clients. Deep understanding of muscle engagements for each movement so that you will activate the right muscle every time! Click the BUY button to make full payment now! 2. 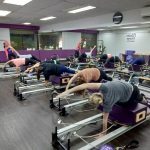 STOTT PILATES WORKSHOPS – EARN YOUR CECS! Clients with osteoporosis face genuine issues when looking for a suitable exercise program. This flexion free workout, developed by the Merrithew Health and Fitness™ team, will share programming ideas taking into account the different forms of the condition and how they will affect your client. Use the biomechanical foundation of STOTT PILATES® to discover how to create effective programs that address the specific needs of this population. Explore how balance and resistance props can effectively assist clients and offer myriad modifications and variations to a mat work routine. Understand the different causes of osteoporosis. Discuss contraindicated movements in various parts of the body. Explore how various light props can aid in exercise programming. Learn how select STOTT PILATES exercises can be beneficial for clients with osteoporosis. Trainers of clients with scoliosis face genuine issues when designing a suitable exercise program. With this workshop, developed by the Merrithew Health and Fitness™ team, learn the different forms of the condition and how each affects stability and mobility. Discover how the fundamentals of STOTT PILATES® can benefit clients with simple or more complex curvature of the spine. Learn to create effective programs that address the specific needs of this population using portable balance and resistance equipment. Understand the different causes and types of scoliosis. Learn how select STOTT PILATES exercises can be beneficial for clients with scoliosis. Limited to first 10 people who made deposit. Attend a group class taught by Sarah Jarvis, Lead Instructor Trainer from STOTT PILATES Headquarters in Canada. I am interested in the intensive reformer course. What if I cannot attend some of the dates given above? Also, do you sell portable reformers?